Given the title of the blog I was thinking that I might just need to update my faithful old camera. That’s not to say that the wonderful iPhone or iPad couldn’t take reasonable shots and be faithful workhorses (it was an iPhone5 that took the sunset on the left) but all in all I thought I should probably start to think about getting back into a bit of “proper” photography. Getting back being the thing. It’s been a while since I messed about with apertures and shutter speeds and depth of field and “all that jazz”. I used to be quite into it. I even remember attending the camera club in High School. Attendance at an after school activity being quite a stretch for me given that I found regular attendance at normal classes a struggle. Now that’s a topic I may return to at some point in the future, but for now back to cameras. I seem to remember having owned a fairly eclectic mix of devices. The earliest I can recall was a little boxy version of the trusty Kodak instamatic, but the first I can clearly remember being enthralled with was an old Mamiya that my Nana gave to me. It had travelled all over the world with her and she just gave it to me because she knew I was interested. Guess that’s what makes Nana’s so special. It was a 35mm and had a strange type of ‘double fuzzy yellow box’ that was the focus mechanism through the viewfinder. It wasn’t an SLR in the true sense but I loved it. It probably was capable of taking some very good shots, but I think it might have been handicapped by the enthusiastic 12-year old behind the lens. I still have it packed away in a box. When I find it next I’ll buy some film and see what type of imagery it takes. Watch this space… but probably don’t hold your breathe, it may take an age to find. Obviously I kept it because of who gave it to me but most other cameras I’ve owned are long gone. I do remember one that was a flat and long design. It took a slim cartridge film that was wound on by pushing and pulling the body of the camera in and out. A bit like a pump action shotgun. Wonder whatever happened to that? I suspect it has gone to the great camera landfill. Anyway, back to the thrust of this. I did attend camera club in an attempt to learn a bit more. I even have proof. That’s me (on the right) and my mate in 1981 taking a selfie before they were fashionable. Trend setters in all regards. Taken with a timed release on one of the school’s Prakticas and self-developed in the club’s darkroom. Ah the wonderful smell of chemicals and the excitement of seeing the first glimmer of the imagery coming through and the mad dash to get it fixed before the paper turned a matt black. 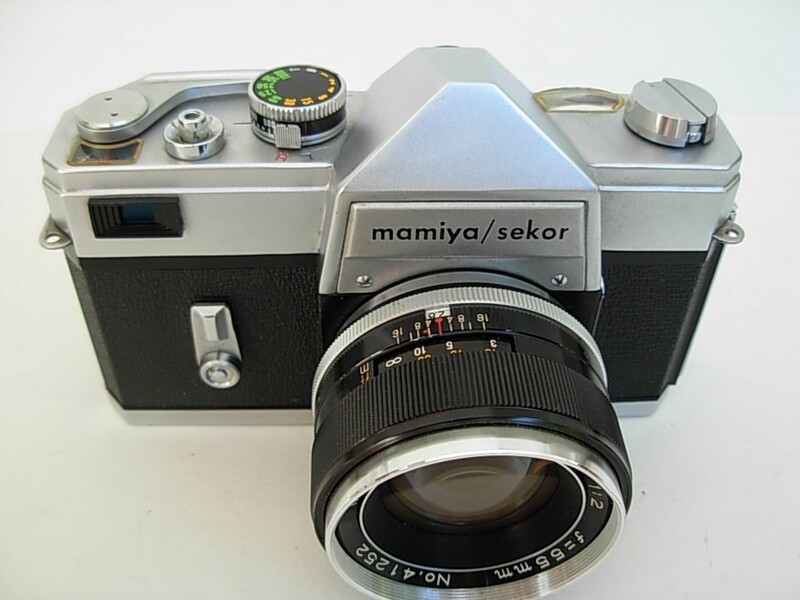 That whole messing about with photography and using the little Mamiya lasted a good few years. Then, during my 20s, I entered my “camera wilderness” phase. Although I do have some really happy holiday snaps from those times I’m guessing they were taken on a procession of cheap instants and cartridge film point and shoots. It wasn’t until 1996, courtesy of the Andrews Air Force PX, that I bought myself a “proper” SLR. The “state-of-the-art” Canon EOS Rebel G. For the next seven years that EOS went everywhere with me (well, up to a point, obviously). I had 35-80mm and 70-300mm lenses and never thought I would grow tired of it. I still have it but to be honest it hasn’t seen much daylight for some time. It started getting relegated back in 2003 when I bought one of the first digital Canon Compacts. It had a whole 5 Megapixels of sensor and I marvelled at the technology. Since then, as each new digital miracle came out, I became increasingly convinced that one day, I would have to grasp the nettle and buy a proper digital SLR. And then iPhones happened. Why carry a camera when you can carry a phone with a camera that outstripped the performance of the first digital I had bought? It seemed that convenience and practicality would win out. So it was until a friend of ours took some photos recently with her digital SLR. I was reminded instantly of the quality and the capability of a “proper” camera. It happened to coincide with the decision to launch this blog and so yesterday, armed with the knowledge that I would probably stick with Canon (because I know how to work them and I still have my lenses) I went forth and purchased. Say hello to my new Canon 600D. It comes with a 18-55mm lens, an instruction book, a set of software utilities and a strap. As to which one of those is likely to tie me in the most knots, well, that is up for debate. I’m looking forward to getting to grips with it and I hope you will look forward to some of the results.